This Balance Me Super Toning Body Wash came free with a magazine a few months ago, and I’ve really enjoyed using it (check out my review here). It’s quite a dark citrus, and is actually quite similar, to my nose, to Lush Happy Hippy, which I also used up this month. Both of these have really awesome scents, although they are quite expensive, as shower gel goes (the Balance Me one is £10.25 for 260ml, the Lush one is £6.95 for 250ml). 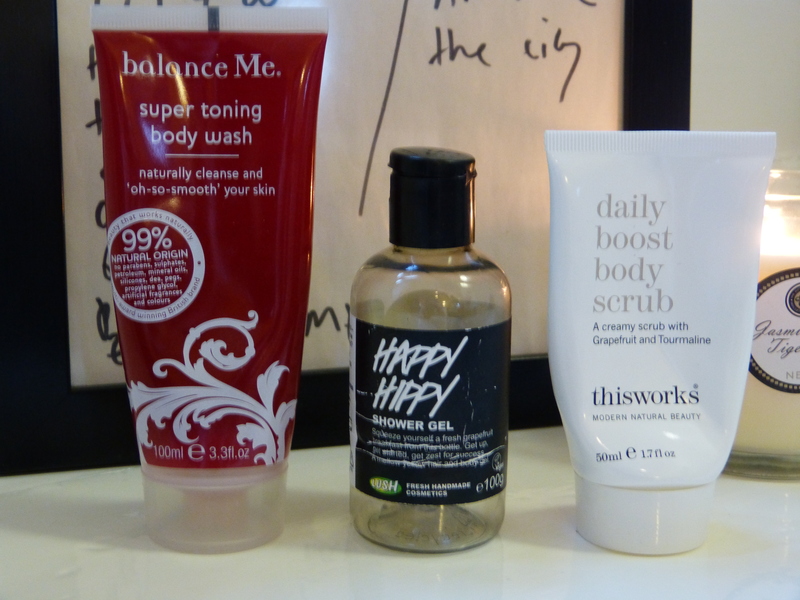 I was less pleased with the This Works Daily Boost Body Scrub, as it smelled awesome, but failed at scrubbing (I reviewed that too!). 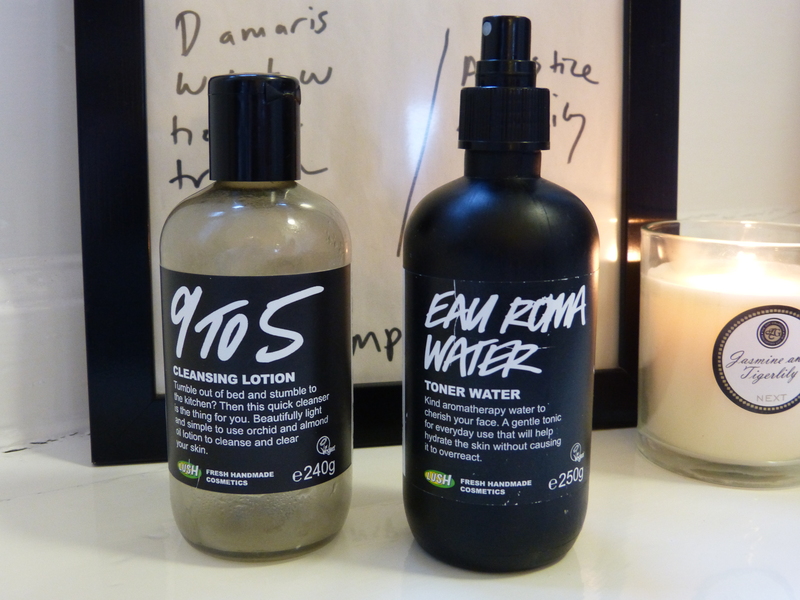 These two products, Lush 9 to 5 cleanser and Eau Roma toner, were the staples of my skincare routine for the majority of this year, and are perfect for someone with slightly dry skin who wants a really nice easy routine. 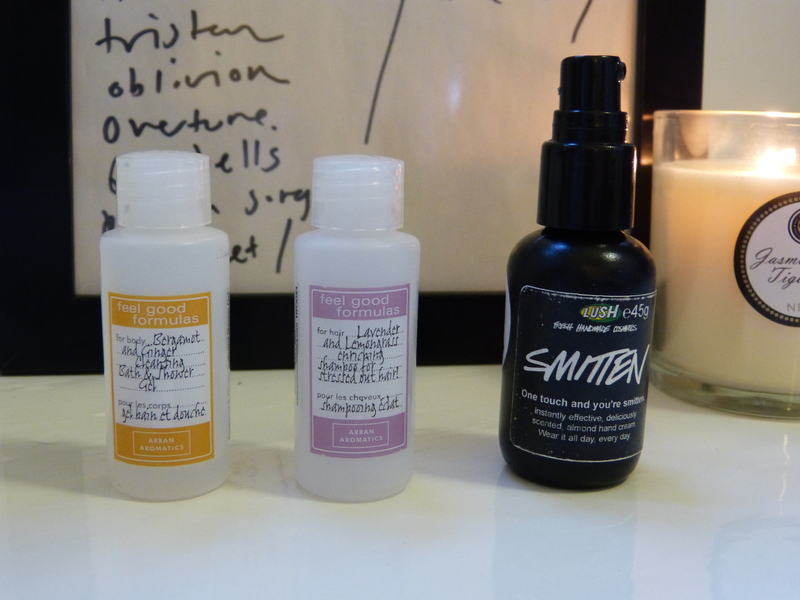 They’re in about the middle of the market as skincare goes, with the cleanser costing £9.25 for 240g, and the toner £7.50 for 250ml, and suited me well. This size bottle lasts for absolutely ages, too (nearly a year for me), so they’re a good investment. A bit of hair stuff now. I finally finished off the Herbal Essences Bee Strong shampoo that matches the conditioner I used up last month – why does it take so much longer to use up shampoo? It makes no sense! Because I always have more shampoo than conditioner, I like to keep a basic conditioner about to match to all the leftover shampoo (still with me?) 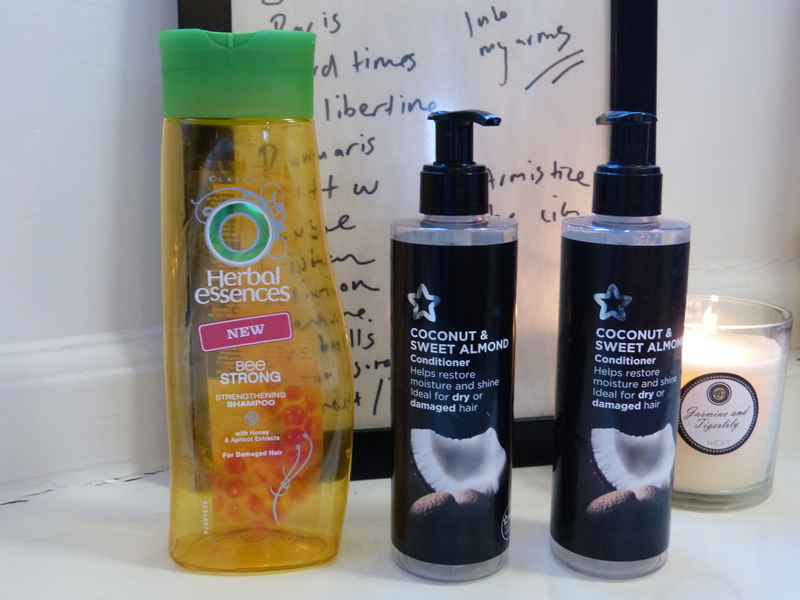 and that’s where this Superdrug Coconut and Sweet Almond conditioner comes in. This is a nice thick conditioner which works pretty well on my dry hair (check out an earlier review here), but I’m not in love with it. This month was also the month of hair treatments! This lovely Ojon Damage Reverse treatment was so messy, but had such good results on my hair that I gushed about it here – the age of that review will show you how long this stuff lasts, too! Where the Ojon made my hair smooth and manageable, this sample tube of Philip Kingsley Elasticizer somehow managed to make my hair curly AND shiny. Just a shame it’s so expensive! I didn’t get on particularly well with Lush Fair Trade Honey shampoo, though. I loved the smell and the idea of it, but found that it made my hair very tangly when washing it, and had no obvious effect on my hair once dry. Two Feel Good Formulas products now, the Bergamot and Ginger shower gel and the Lavender and Lemongrass shampoo. I used both of these as shower gel after snaffling them from the hotel we stayed in in Hay on Wye. They have gorgeous scents, but the Bergamot and Ginger is perhaps one of my favourite shower gel scents of all time. I have two little bottles left, but I’m going to need to buy a big one when they’re gone (you can buy it online from the Arran Aromatics website)! Lush Smitten hand cream, a gift from one of my friends, was a really nice thick hand cream, but it had an overwhelming Snowcake scent that wouldn’t be to everyone’s taste. I also found the bottle and pump slightly clunky to use. Nevertheless, a good hand cream – you can buy it from Lush Retro here. 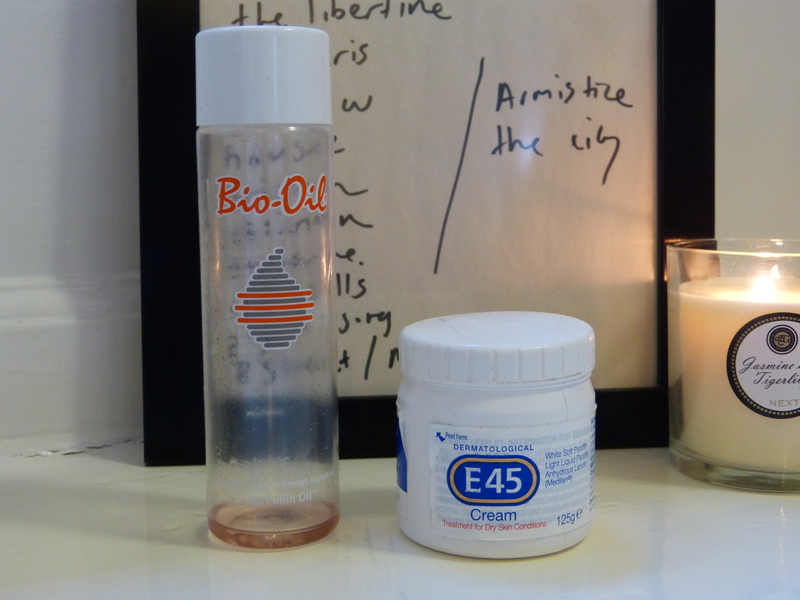 A couple of “no”s from me here: Bio Oil and E45 cream. Both of these were bought to deal with serious skin issues (stretch marks and eczema respectively), but since I have neither issue anymore, I decided to use them up as general moisturisers. One. I do not like oil on my body. Two. I don’t have the kind of dry skin that needs E45 levels of moisture! So I would recommend these for serious use, but not for general moisturising. 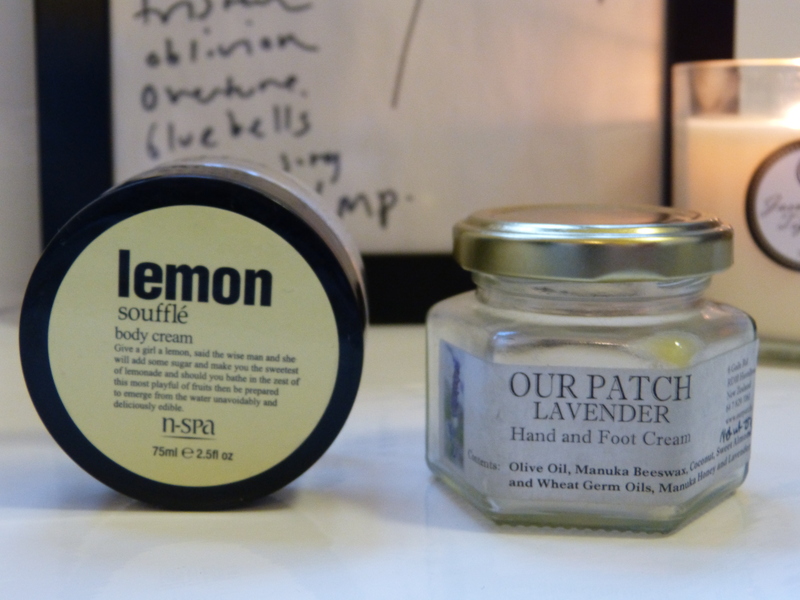 More general moisturising is definitely well supplied by NSpa Lemon Souffle body cream. This is actually discontinued, although I recommend the new style NSpa body butters. I really liked these moisturisers, though, they were the perfect halfway point between lotion and butter, and smelled really good. I didn’t love the Our Patch Lavender Hand and Foot Cream, though. I found it very greasy (way too heavy for hands), and I’m not a fan of lavender scents. So this was relegated to use as a foot cream, and I’m very glad it’s gone. It’s been quite the month for skincare, too. I finished up my Garnier Moisture Match day cream (the green mattifying one), but found that although I loved it to start with, my skin stopped having its oily hissy fit and this ended up not suiting me. I really love the smell, though, it was so nice to apply something with such a fresh scent in the morning! I would definitely recommend this if you’re looking for a good budget moisturiser for oily skin. 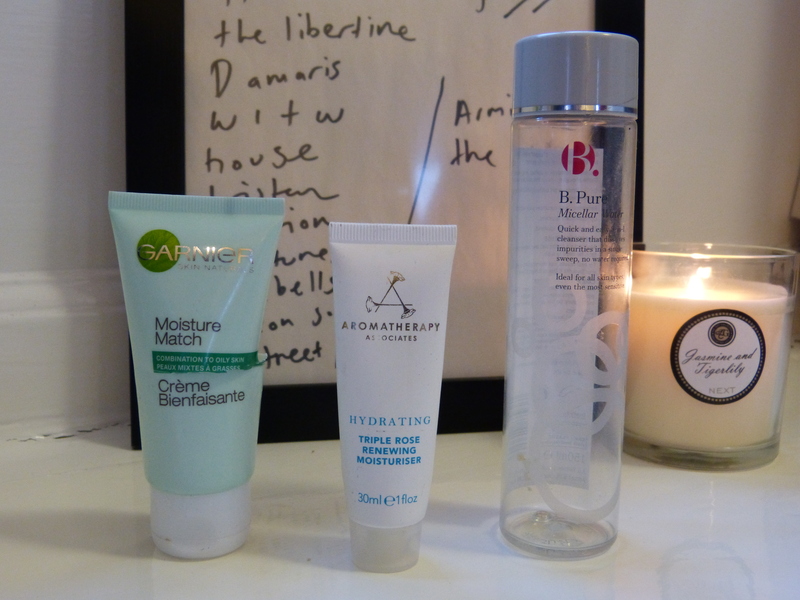 The Aromatherapy Associates Hydrating Triple Rose Renewing Moisturiser is by no means a budget option! I picked this up in the summer when it was free with a magazine, and enjoyed using it, although I would recommend it only to those with very dry skin, as it’s super rich. The rose smell is amazing. And finally, a product I hated: B Pure Micellar Water. This did absolutely nothing for me but sting my eyes. I think I reviewed it previously and didn’t think too much of it then, either! 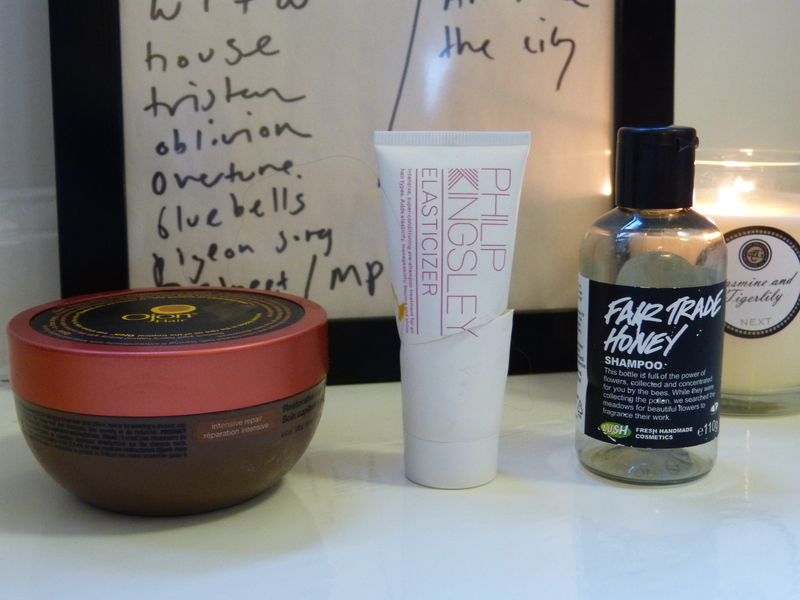 I used it as a preliminary cleanser, but that’s not a step I care to have in my routine normally! What? Two lip balms finished in one month? It’s amazing what you can do when you put your mind to it! I’m a big fan of The Body Shop’s lipbalms, but found this Satsuma Shimmer Born Lippy pot to be much stickier than the other flavours I’ve tried – perhaps it was the glitter? I got on far better with this little yellow owl, which was vanilla flavoured. These are super cute and would make a lovely stocking filler for someone! Good old Nivea Creme can be used on anything, and this tiny little pot was great for keeping in my bag for on-the-go moisture. I used a lot of it as lip balm and hand cream. Odds and ends, now. I liked Lush Dream Cream a lot, but it’s definitely not heavy enough for my skin in winter, and I’m not a huge fan of the scent. I like the natural ingredients and the fact that its suitable for very sensitive skin. Two perfumes, as well. I liked this Estee Lauder Pleasures solid perfume, but my gosh did it last a long time. I mean, we’re talking years. I’m quite glad it’s finally made its way out of my make up bag! I’m sadder about the demise of Lush Love perfume, but I have another of these mini sized bottles, and also a full size, so I can keep wearing it! This is one of my favourite autumn/winter perfumes. And to finish off, two little sachets. I love the way that Palmers Cocoa Butter Formula makes my skin feel, but I just can’t get on board with the scent – I really hate smelling of chocolate! 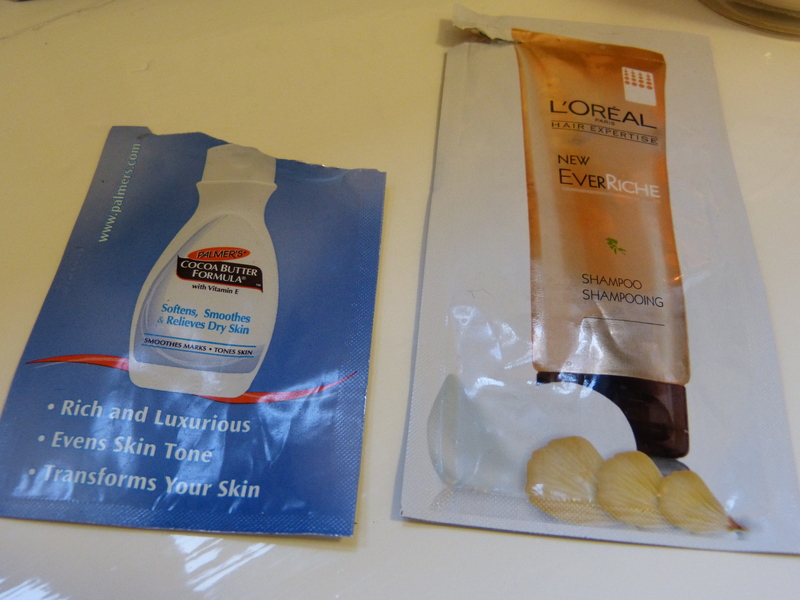 It just seems so unfair to make me want chocolate when there isn’t any… I did really like the L’Oreal Everriche shampoo, though. It seems like a very moisturising formula, and I’d be keen to try out a full-size if I saw it on offer! Whew! What a lot of empty products! I don’t know how I managed that. Of course, there’s all the bath bombs and soap and so on that I can’t show you… I particularly enjoyed all the Lush Halloween items. As always, leave me a link to your empties posts! They’re one of my favourite things about blogging. This entry was posted in Beauty and tagged beauty products, beauty stash, empties, empty products, haircare, lush, lush cosmetics, moisturiser, products i've used up, shower gel, skincare, stash, toiletries, use ups. Bookmark the permalink. 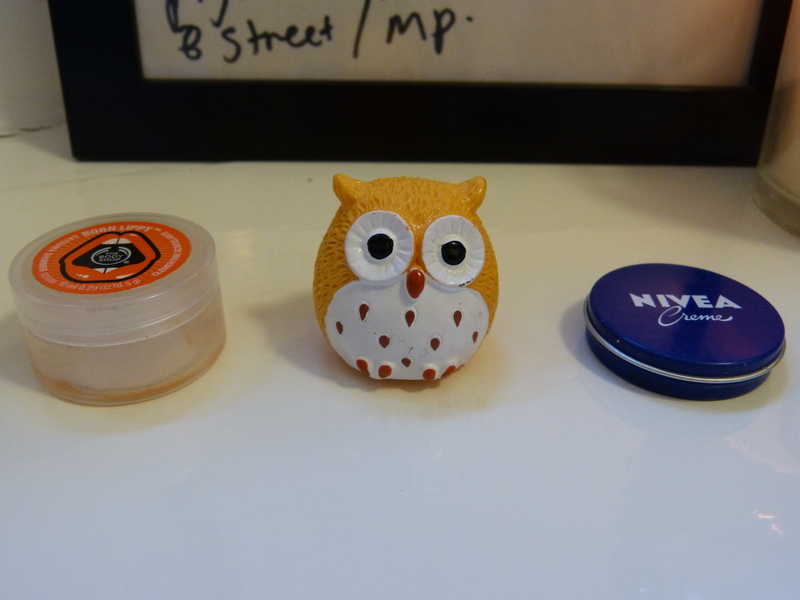 That owl lip balm is adorable. I’ve ordered some EOS lip balms and waiting for those, my lips get ridiculously dry come winter time. They’re so cute! I’ve been meaning to try EOS, but I’m a bit put off by the roundness, not sure why… Have they come yet? What are they like?